I've followed several tutorials and added different IAM configurations and security groups to keep things as open and obvious as possible and nothing has worked. 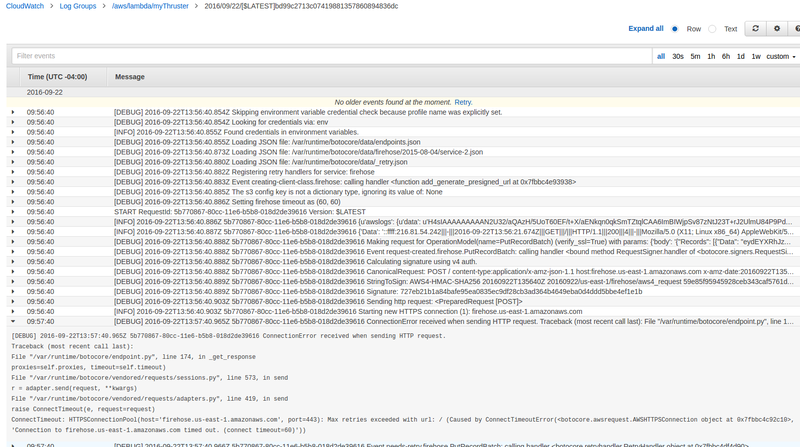 Here is the debug log, and the main error pasted below. Let me know if there's any other data I should add to make this clear. [DEBUG] 2016-09-22T13:57:40.965Z    5b770867-80cc-11e6-b5b8-018d2de39616    ConnectionError received when sending HTTP request. Please follow my answer in this thread. This will explain how to make lambda contact any service on the internet (such as S3, kinesis and so). Currently you can't connect a Lambda task directly to Kinesis Firehose, only to Kineses Streams. One way around this is to let Firehose write a file to S3 and then trigger a Lambda task via S3 event notifications. Not the answer you're looking for? Browse other questions tagged https aws-lambda boto3 amazon-kinesis-firehose or ask your own question. Can Amazon Redshift Autofeed INTO a Kinesis Firehose?